Spread the turkey stuffing to cover the bottom of the prepared pan. Sprinkle the chopped turkey over the stuffing. Sprinkle the shredded cheese over the turkey. Crack the 12 eggs into a large bowl. Add the mushroom soup, milk, poultry seasoning, salt and pepper. Whisk and mix well until the yolks are all broken up. Pour the egg mixture over the cheese evenly. Spray one side of a piece of aluminum foil with cooking spray. Cover the baking pan, sprayed side down and seal the edges. Uncover and cook an additional 30-40 minutes or until the casserole is cooked through and the top is golden brown. Top with optional herbs and serve warm. 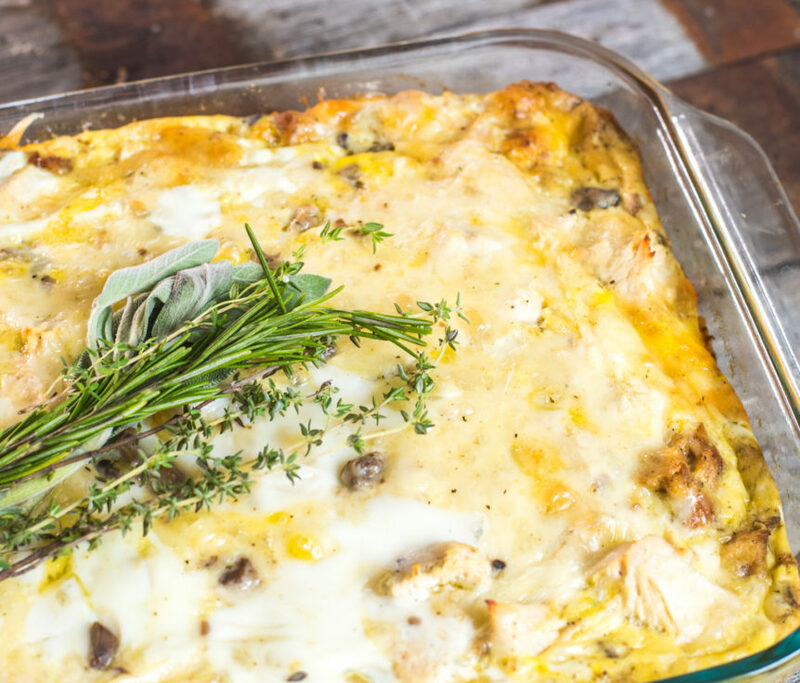 This casserole can be baked immediately or covered and stored in the refrigerator overnight to bake in the morning.